It is unfortunately common for people to get scammed nowadays. Everyone is susceptible to it, but who is targeted most easily? The elderly. With age comes memory problems and disorientation, which heightens vulnerability to manipulation. The Grandparent Scam is when the caller targets an older person posing as their grandchild, and claims that they need money. Their fictional needs for money vary, but one common example involves getting out of trouble with the law. An elderly victim might hear the caller say something like, “Grandpa, it’s Bobby. I’ve been arrested in Tulsa and need $1,500 for bail. Please don’t tell my parents, and can you wire it immediately?” The caller takes an urgent, desperate tone, which appeals to a grandparent’s need to protect and nurture. Scammers are thorough. Usually, they know the name of the person they are trying to scam, and even the grandchildren’s names among other scarily personal details. The most common sources of this information are multiple social media platforms, including Facebook and Twitter, which is essentially how they choose their targets to begin with. 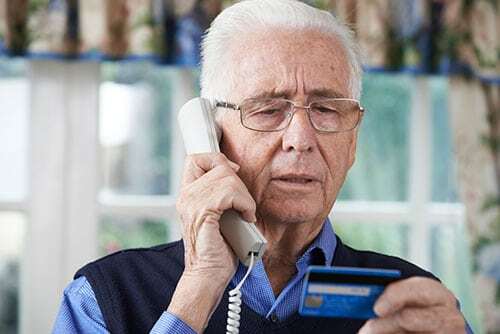 If the scammers lack this beneficial personal information, they try to use emotional appeal to get the older person to give them the information themselves. This can make the scam seem authentic. Be sure to ask frequent questions that only the person they are claiming to be would know. For example: their birthday, their mother’s birthday or even their pet’s name. Don’t agree to wiring any money. You should end the phone call and try to contact whom they claimed to be or other family members who can help verify the situation. REPORT IT. Don’t be embarrassed. Call the Federal Trade Commission or local authorities. If money was wired, try to contact the money transfer service that you used. If it has NOT been picked up yet, you can get it back. Ultimately, be aware for yourselves and your loved ones. TeleCalm aims to protect those suffering from Alzheimers and other dementias by creating a barrier between the scammers and your loved one. Caregivers can manage approved lists of callers to ensure scammers are not dialing in and cashing out your loved one’s bank account. To learn more about how the service works read the FAQ page or click to sign up today.